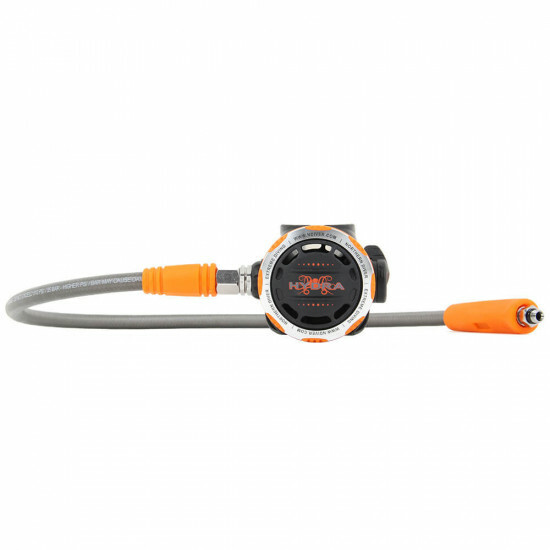 Northern Diver’s EN250-A certified Hydra regulator is designed for cold water (less than 10ºC) and more extreme diving conditions, as well as warmer water and less intensive dives. 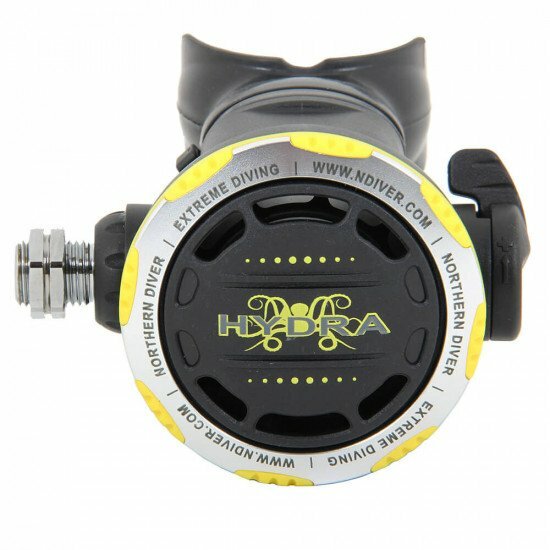 The Hydra is supplied with a regulator case and computer case, and it’s available with a DIN or A-clamp connection. See below for the regulator’s complete specification. The first stage system is created from a single piece of brass, which is then subjected to an electro-galvanic process. Environmental and O-ring sealing protect the first stage’s internal mechanism from freezing, moisture and foreign matter such as salt. The internal component parts of the first stage are made from chrome/nickel coated brass, the springs from stainless steel and the seals from nitrile rubbers. Particular attention was paid to the separation diaphragm by making it from a special rubber resistant to low temperatures. Four low pressure ports (3/8” x 24 UNF thread) and two high pressure ports (7/16” x 20 UNF thread) feature on the Hydra’s first stage. 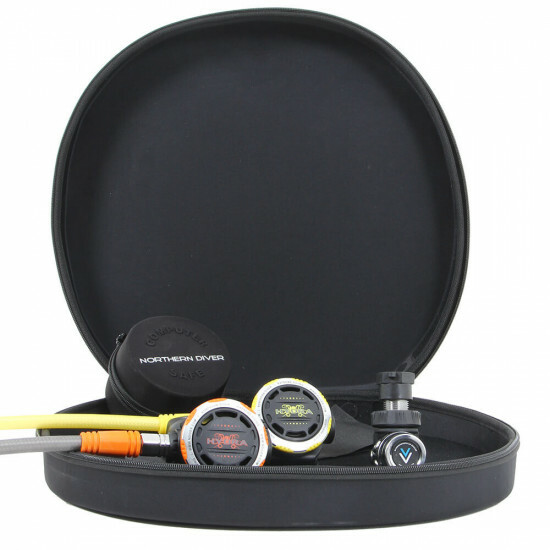 The second stage case is made from a synthetic resin highly resistant to impacts and abrasion, and not attacked by UV rays and chemical agents. 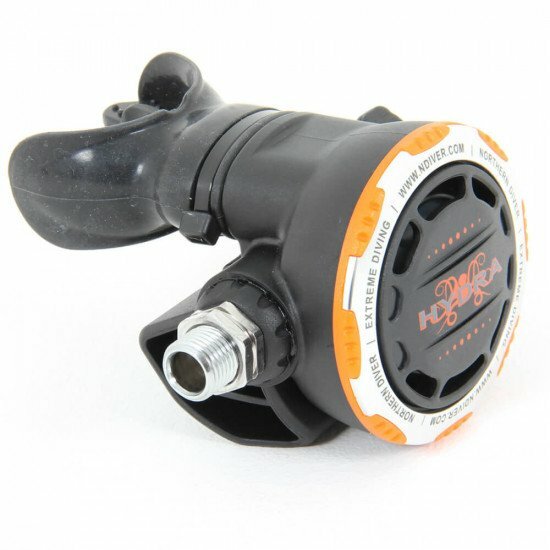 The diaphragm, the exhaust valve and the poppet seat are made from silicone. The other inner components are made from chrome-plated brass and stainless steel. The mouthpiece is hypoallergenic silicone. 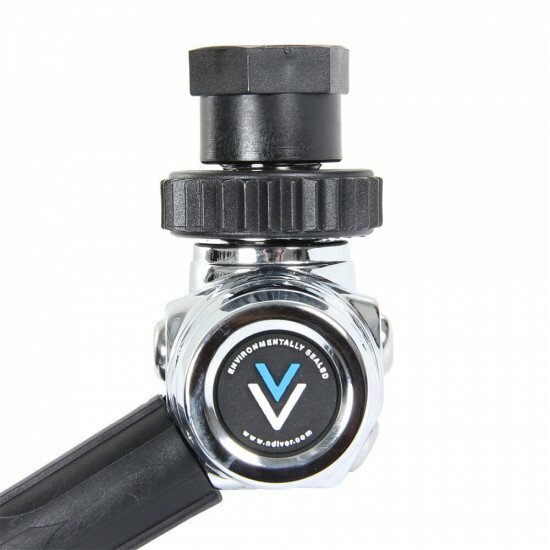 To adjust the breathe of the regulator, the venturi lever (+/- lever) on the second stage can be moved as required. The octopus has the same technical specifications and materials as the second stage. 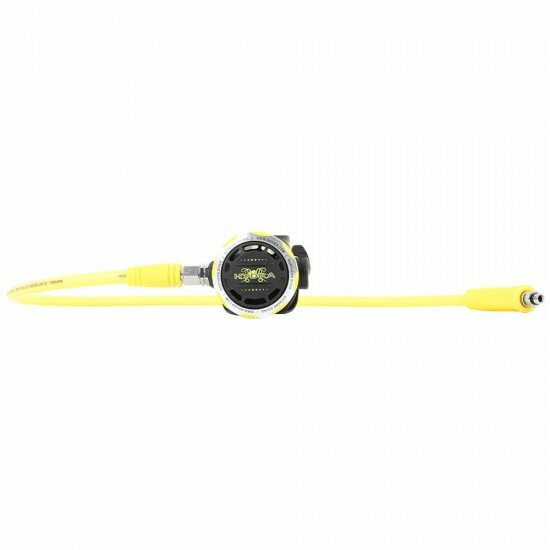 The only differences are in the colour of the shield and hose, which are yellow, especially designed for easy identification in an emergency. The octopus’s hose is 1m long for quick access. 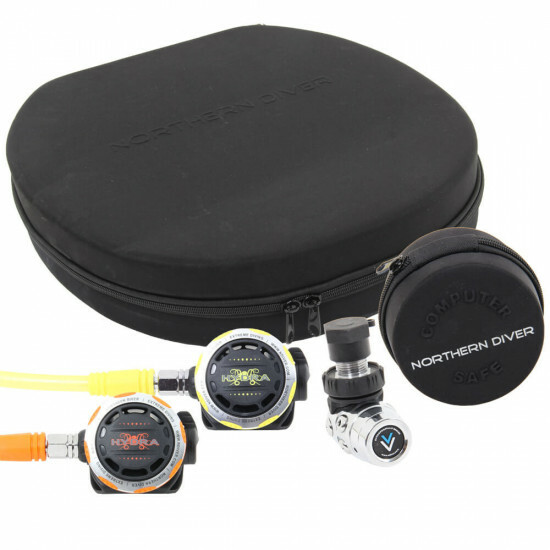 Please note: No dive computer is included in this package. 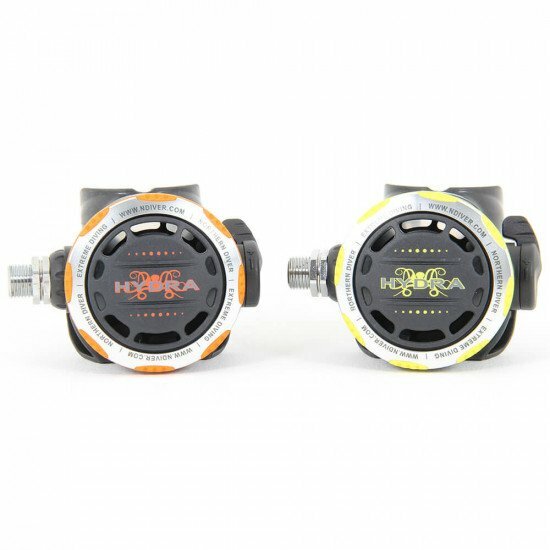 After changing from another popular brand of regulator I found that the Hydra regs are on par if not better. 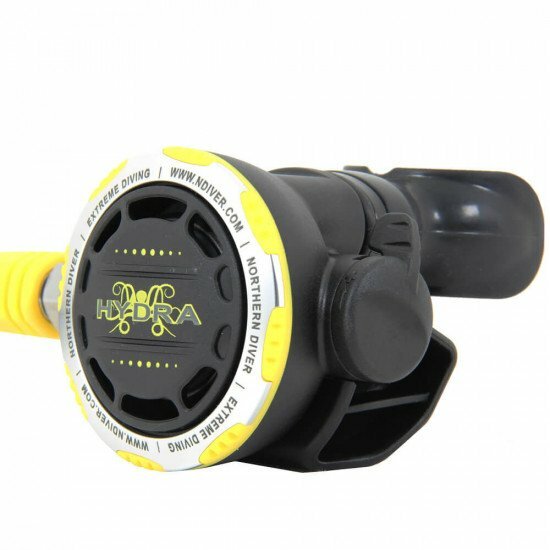 As well as stylish and good looking the Hydra regs are easy to use/setup and they are very easy to purge using a simple push on the front cover of the regs. I have highly recommended the regs to a number of experienced divers in my dive club who were very interested in them. Choosing the best budget regulators . . . . 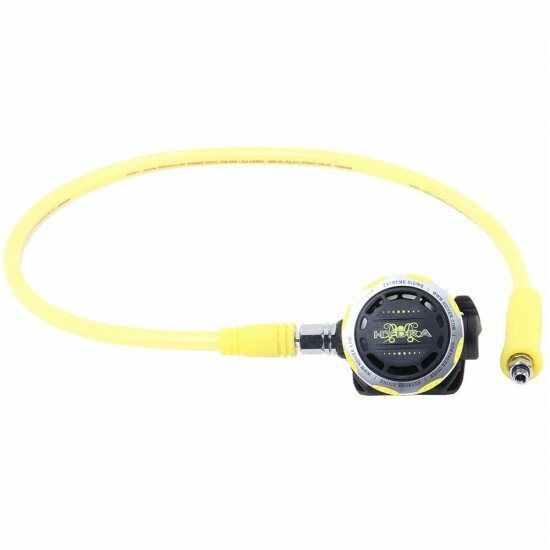 I have been Diving for 40years and have only used Poseidon demand valves.Decided to have a change and decided on the Hydra last year this regulator has performed extremely well with no problems in warm waters,have not used it in a cold water environment.At the moment I’m diving in the Indian Ocean using the Hydra in upto 60m with no problems,but on my last Dive on returning to the surface I find I no longer have the second stage diaphragm retaining ring.It had come unscrewed and lost during the Dive or on the surface. Maybe this needs some sort of locking mechanism??? ?